Where she lives they see Orcas swimming past in the sea! She has recreated the spectacle in paper using a crank slider mechanism. If you look closely at the picture she sent you can also Mt. Rainier in the background. What a fantastic looking place! Cathy also sent through an animation of her splendid Orca model in action. Spurred on by interest from visitors to her stall at the local farmer's market Cathy has created a simpler downloadable version with a single Orca, again based on a crank slider mechanism. Now anyone with access to the internet and $5.95 can download and make Cathy's design. Very nice it is too. Thanks Cathy, I've got mine printed out and ready to go! I downloaded Cathleen`s paper model. It is easy to build and has a good function. The box is printed on blue carton. With this templates can you a model with one "Orca" built. For a modification with three animals, the originals are printed twice. You must expand or lengthen the box itself constructively. The parts for a triple crank can be fitted together and glued. For the trunnion I have used tubes (Crank slider next generation). Very Cool! I'm so glad you enjoyed putting the kit together and riffing on it so well! 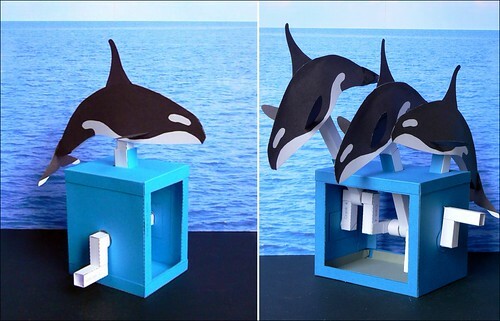 I have had requests for a 3-orca kit, but just have not gotten around to putting together the instructions for one. You did a very nice job and I LOVE the video–with sound effects even!